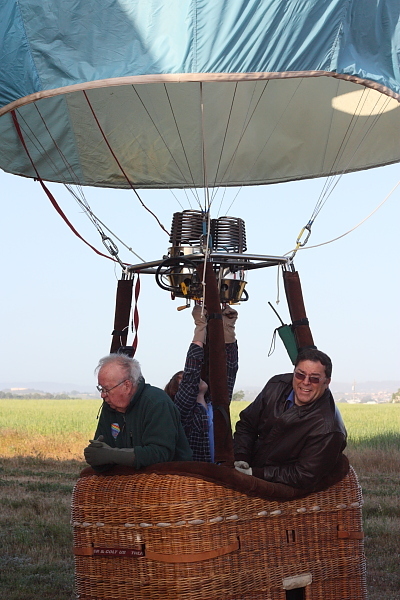 Pictures of my April 2010 balloon ride over Paso Robles, California. Thanks to Rick and Lucinda Wallace and the Estrella WarBird Museum! 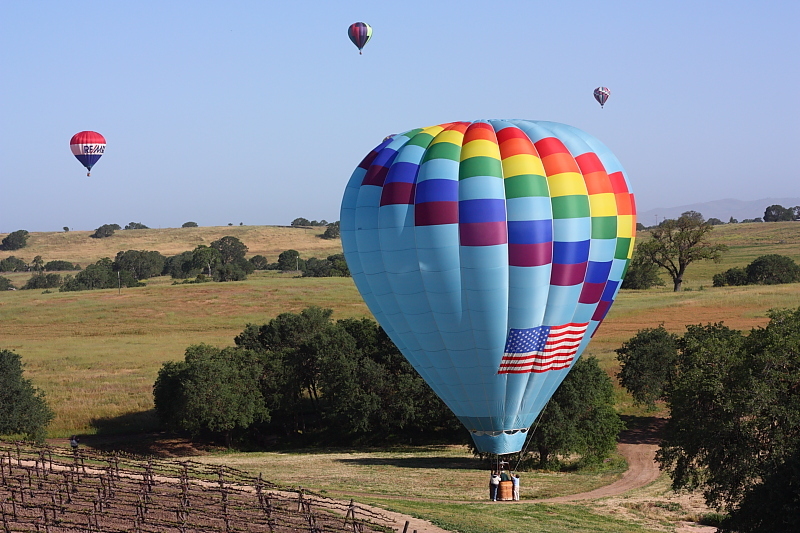 On April 25, 2010, I had the pleasure of taking a great hot air balloon ride over Paso Robles, California... thanks to my friends Rick & Lucinda Wallace. I had placed one of my puppies with the Wallace family back in 2007, and we've been great friends ever since. They've been ballooning for 30 years now... and are now on their third balloon after literally wearing two others out over the years. This was my second flight with them. 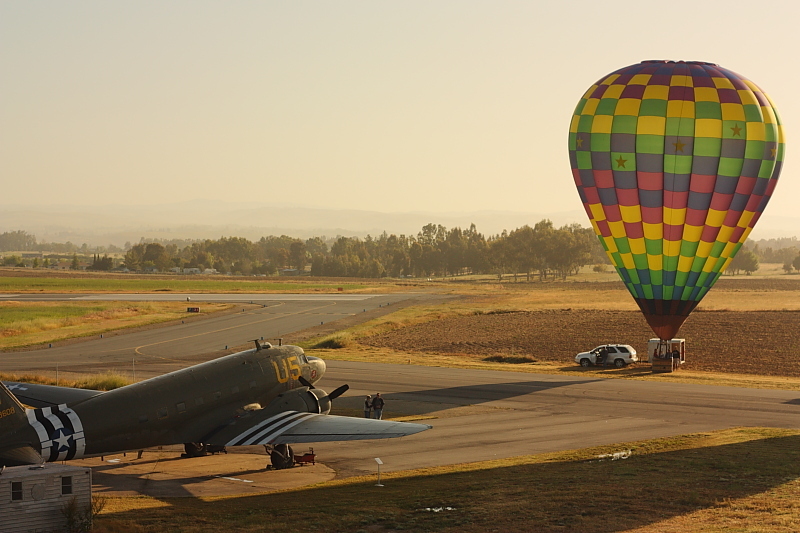 On this page, I'll share some great photos that I took that day with my Canon Digital Rebel camera... tell you just a little bit about our takeoff point, the Estrella Warbird Museum... and I'll even show you a little bit about how a balloon is set up prior to the flight. Let's get started by showing off one of my favorite photos from that day... as we made a very low pass over the Hunter Ranch golf course. 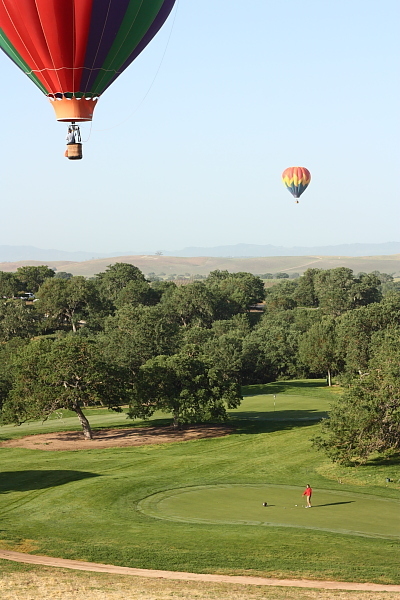 Can you imagine trying to concentrate on putting while hot air balloons are flying overhead?!? 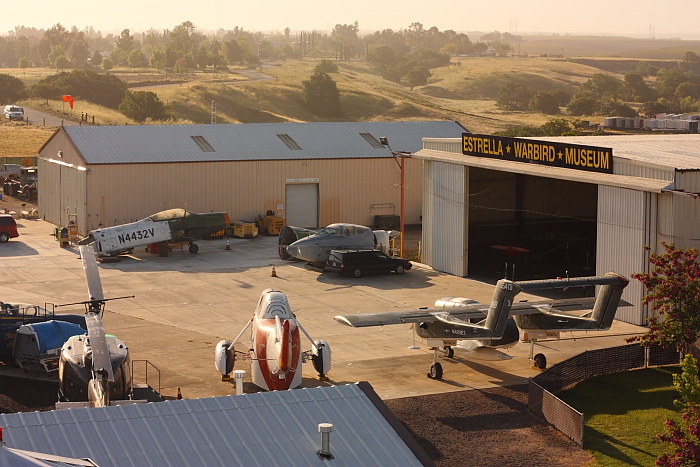 As I mentioned, our take-off point was the Estrella Warbird Museum. They've got this fantastic collection of old warplanes, as well as all sorts of military equipment on display. 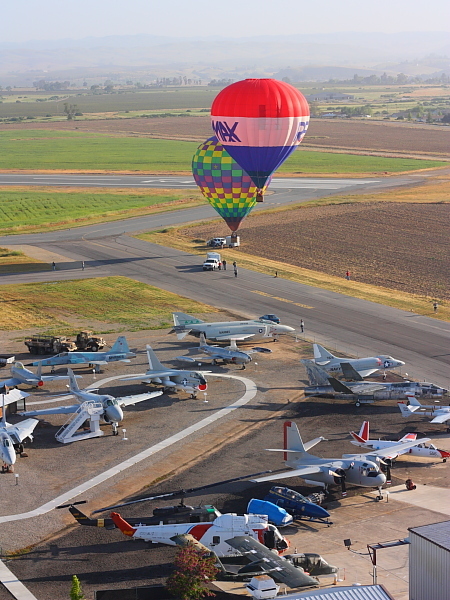 It is located directly adjacent to the Paso Robles airport. 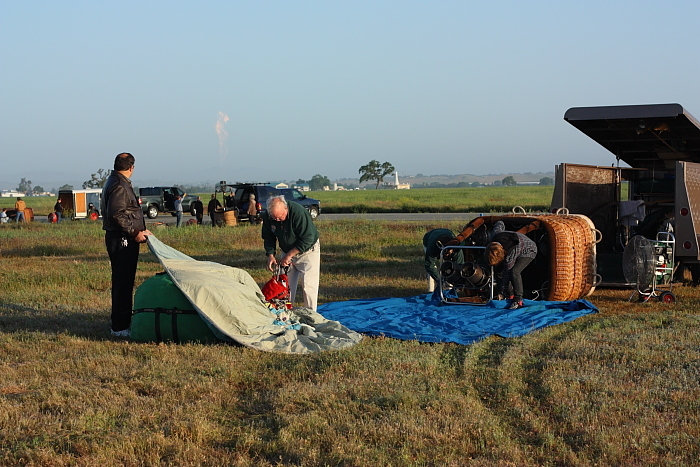 Setting up the balloons next to the old warplanes was a visual feast, especially in the early morning light. they work on restoring the newest additions to their collection of warplanes. 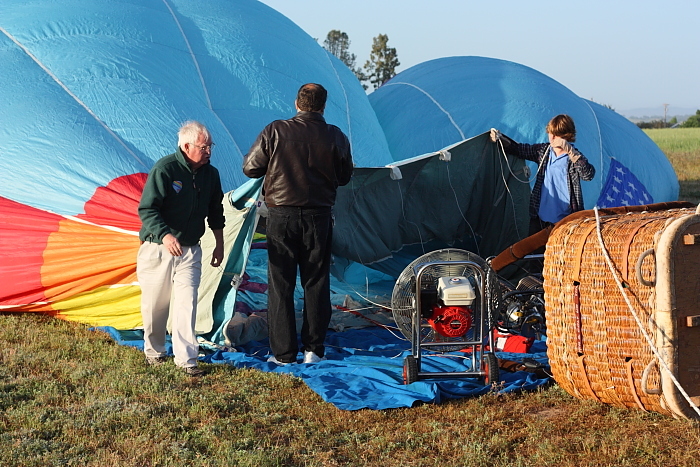 Here is a set of pictures that give you an idea of what's involved in preparing a hot air balloon for flight. As I mentioned earlier, Rick & Lucinda Wallace have been doing this for years, so they've really perfected the process and made it about as simple as it can be. Everything is stored in a trailer that they tow behind their S.U.V., and a hydraulic lift system built in to the trailer helps to do the heavy lifting. who just recently got his student pilot certificate. his training moved to a new level now that he is officially a student pilot. with grandpa taking over at the end for the trickiest part: landing it! would be coming along on the flight with us... so he got drafted to help with the setup. Here they are putting together the frame that supports the burners. Notice that at this point Alex was not wearing gloves. he learned (the hard way) that wearing gloves is a must when working with propane! it's time to start taking the balloon out of the storage bag. it's hard to believe that it all fits inside that green storage bag! By the way, notice in the background that another balloon crew was testing their burner. It makes a heck of a noise, which definitely got Peter's attention. 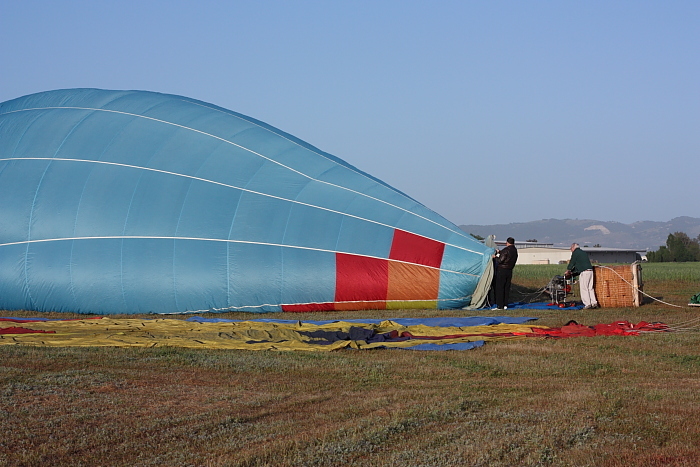 Once the balloon is laid out on the grass, it's time to start inflating it. A gasoline-powered fan is used to blow air in to the balloon. By the way, notice that Alex now has his gloves on! to heat up the air in order to create some lift. After the burners have heated up the air inside the balloon, up she goes! 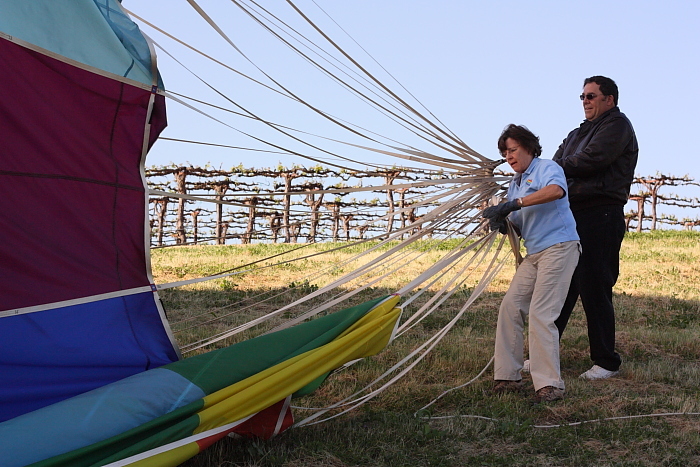 Rick's wife, Lucinda, makes sure that the balloon goes up in a slow, controlled manner. in an arc that would flip it over in the other direction! You can see that other balloons were going through the same process at the same time. There were about ten balloons that were all flying together that morning. Once there's hot air in the balloon, things start to happen really fast. the balloon was just seconds from takeoff. It was time for the photographer to jump in! A few seconds later, Lucinda waves goodbye as we start to lift off the ground. and quite often it ends up landing somewhere without very good roads! A 2-way radio system keeps the chase team and the flight team in contact. 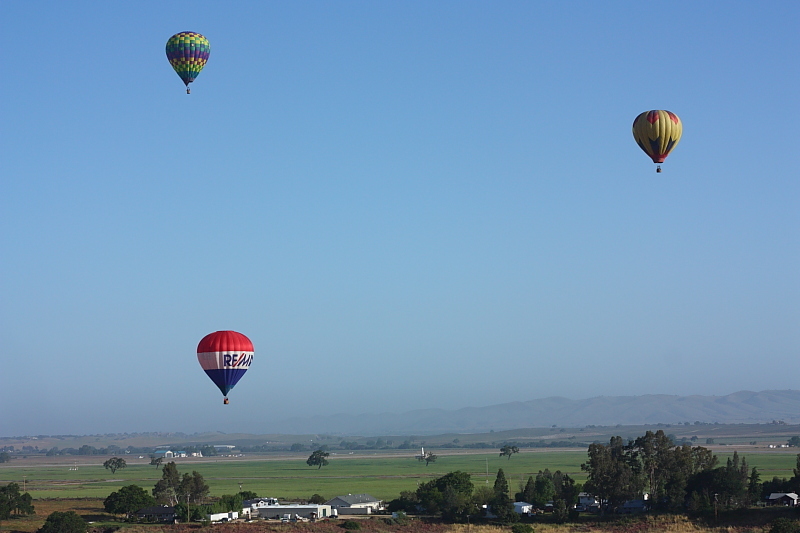 Once we got up in the air, there were some beautiful views of the countryside and the other balloons. 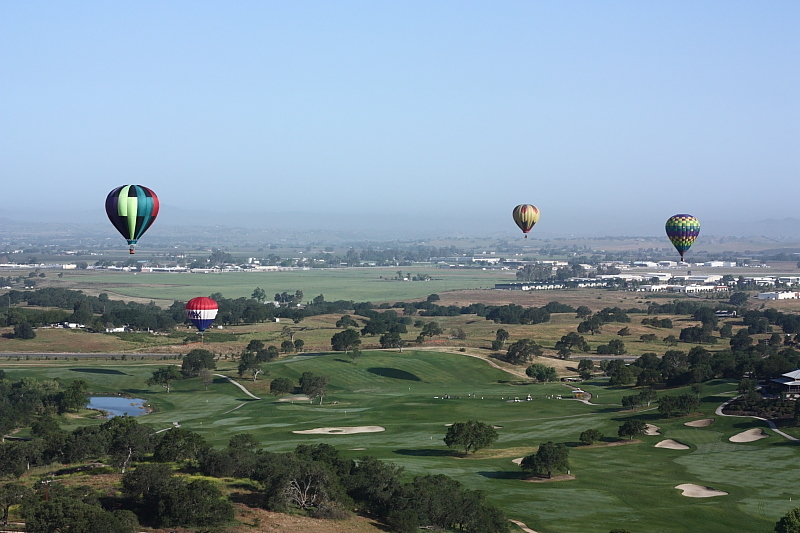 Flying over the Hunter Ranch golf course in Paso Robles. a small clearing next to a vineyard and some oak trees. our horizontal motion just prior to landing. Another really impressive sight was to see how hard Lucinda worked. She will be the first to tell you that she is not a young woman! But nobody complains about hard work when they are doing what they love to do. 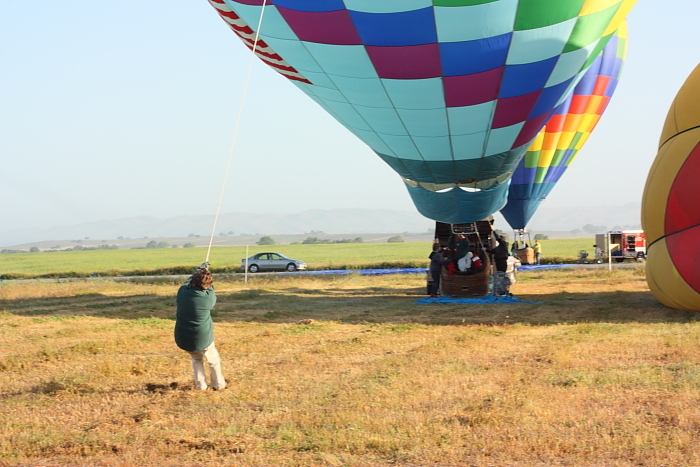 On the chance that you've found this page because you are looking for information prior to taking your very first balloon ride... let me tell you a few things that you might not know about being a passenger in a hot air balloon. 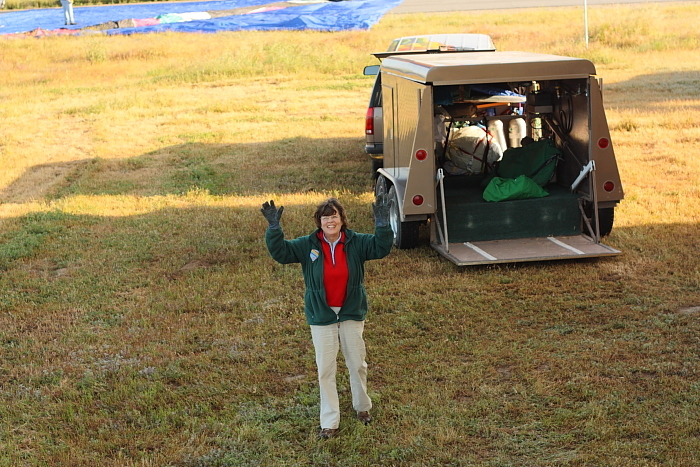 Be ready to help out with the physical chores involved in getting the balloon ready for flight, and for packing it up after flight. 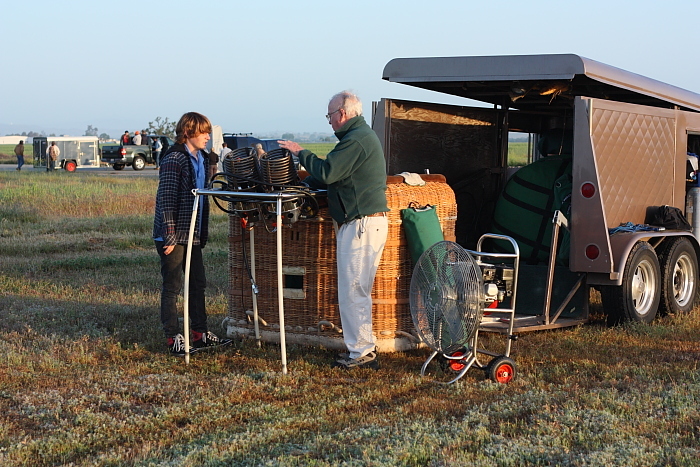 The help of the passengers is almost always needed, unless the balloonist has a really large ground crew! The gondola is very small, so don't bring along anything that you don't need during the flight. Leave purses, backpacks, and any other bulky items with the chase team. 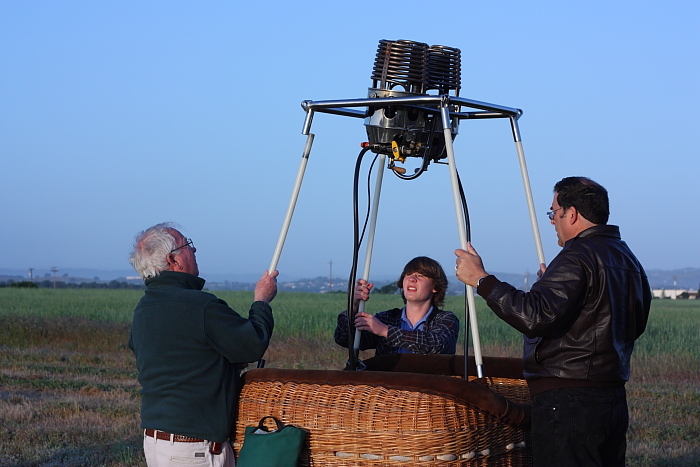 Ballooning is generally an early morning activity. While there are sometimes flights towards the very end of the day, early morning flights are most common... because that's when the wind conditions are usually most favorable. So, if you're not a morning person... this isn't for you! Your balloon pilot has a LOT on his mind! Of course, you can ask a few questions and learn a lot from your pilot... but try not to chatter so much that he can't pay attention to flying safely. In almost all cases, you get in and out of the gondola through a combination of climbing and pulling yourself over the top of the basket. This requires a reasonable amount of leg and arm strength. It can be really cold up there early in the morning! Dress appropriately. On the other hand, those burners can really fry your head when they are firing. A hat is helpful to protect your hair. There's no bathroom aboard... and it may be quite a while after landing before you get to a bathroom. Empty your "tanks" as close to take-off as practical. If you click on the Amazon.com banner and then make any purchase from them, they will send a commission our way. The more you spend with them, the more they send our way. We pay our web server costs from these commissions. Please note: You do NOT have to have a PayPal account and you do not have to join PayPal to make a donation. There is a LOT more to this web site than just this page! or by clicking on one of the quick links below. Copyright ©2014 Jim Zimmerlin, Grover Beach, California. All rights reserved.